How did you welcome 2016 ? Aussie-land got there before the UK, and at 2pm ( UK time ) I got a 'phone call from our respected member John Luck @Ferret whose clock apparently told him it was 2016 already ( LOL ) and we had a real nice chat - and I even played "Auld Lang Syne" on the viola for him over the 'phone !!! Probably still another 5/6/7 hours (state dependent) USA side - but best wishes to you all, world wide - and have a happy fiddling 2016 .... yayyyyyyyyyyyyyyyy- anyway - let us all know in what sort of musical fashion you welcomed 2016 ! My wife and I celebrated quietly last night with a few drinks and snacks as usual. We gave up waiting for midnight years ago - there doesn't seem much point when there's just the 2 of us - but had an enjoyable time nevertheless. I must have overdone it with the homebrew because the fireworks from nearby Newcastle at midnight didn't wake me up. My hubby and I used to celebrate New Year's but we are at present party poopers!! I was in bed by 10:30, I'm not even sure if my hubby made it to midnight or not. Happy New Year to everyone at "Fiddlerman" and beyond. 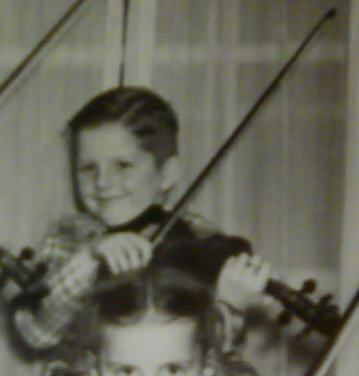 Mine was as usual, fell asleep 11:00 watching the old TV series, "Twilight Zone", woke up at 3:15am and went to bed, so I didn't see the New Year come in, but did play my violin for about 5 hours off and on prior to that including changing the tail piece on my, "Frenzo Bartali" violin. Forgot about, "Auld Lang Syne". I stayed up because my dogs don't like the fireworks, but I didn't watch any of the shows like I used to. Instead I spent the day playing the fiddle off and on, didn't do typical practice stuff, like scales and things, but just playing the few songs I know. After a bit of an unusual week (my mom was hit by a truck while walking in a crosswalk on Monday... she's ok, just banged up, but not a good thing to happen to a 70 year old, lol) it was nice to just have a normal day again, lol. Don't seem like the lack of sleep affected your playing any @BillyG . Sounded great! @damfino, glad your mom is ok, I'm sure it really scared the both of you though. @BillyG , Very nice playing - thank you for sharing this very appropriate tune for New Years! @damfino , Am glad your mom was not seriously injured. What an awful experience, especially now during the Christmas season. My New Year's Eve was quiet. Played violin, worked on transcribing a fiddle tune recorded locally, and was asleep before midnight. We toasted for the new year at 12 midnight, then followed by my daughter's vomiting around 12:30 (she might have drunk it too fast and the bubbles pushed back up? ), and clean it up till 1:30am and went to bed around 2:30am. Btw, I reconnected with several long lost friends and chatted a little. Then woke up around 8am, watched a little Chinese soap opera, woke my daughter up around 10:30am and headed to China Town to have dim sum to celebrate. It was pretty busy there and watched some lion dance. The lion dance team was actually pretty famous, it's from San Francisco area and had won second prize in world lion dance contest. We are lucky to see it right in front of us. They did a great performance! After that, we shopped a little . Bought a birthday cake for my daughter, too, but will save it for tomorrow. Btw, Phoenix Bakery is a famous bakery in Los Angeles China town that is famous for their Strawberry cake. WE didn't get that one because they are usually gone before noon. We got 3 lache (milk) cake to try. Then we headed home and shopped some more for grocery and goodies at 99 ranch. We munched on shrimp chips on the way home. Then we stopped at Walmart, my husband went to get milk and eggs and hay for the guinea pig, and I took a nap (I am still adjusting to jetlag). Once again, happy new year before it's over! Thanks for that Bill and I too am very happy to hear that your mom is OK Mandy. That must have been scary. Mandy I am sorry about your mom... wow.. that was quiet shocking . ..I am so glad she is ok.
Great video Bill.... back at ya... I feel like a chump for not recording much lately. The good news is that I play as much as ever ... even more. I did my best to play some violin.. I made a yummy soup..... I toasted to the New Yorkers at 9 pm with my champagne. I went to bed... tried to stay off Facebook.. got a call from my daughter at 11 pm.... we had some champagne and giggles. And the year starts with lots of musical and best wishes for successful violin journeys for us all. Hallelujah, Game of Thrones, Let it be, Imagine, Yesterday, Clair de Lune (easy version)... and a few others.. SHIFTING SHIFTING VIBRATO VIBRATO BOWING BOWING FOURTH FINGER!!! I am ready and poised for my fifth year to be my best year ever and I hope the same for all of you. I'll add my best wishes for your mom, @damfino . Glad she was OK, but it sounds like a very frightening experience for both of you. @Leana : Was that you? I couldn't tell if it was you or Lindsey. 🙂 But, seriously, what a lovely setting. Were you on vacation or are you lucky enough to live in that tropical paradise? Thanks for posting your Auld Lang Syne video, Bill. Nicely done! And thanks for starting this thread. It's fun to hear how folks celebrated the New Year. Mr. Scratchy and I went out for an early dinner then I did an impromptu show on StreetJelly.com. It was a guitar show...I was a little too tired at that point for fiddling. We did not stay up to ring in the New Year. Haven't done that in quite a long time. Happy New Year to all my Fiddlerman friends! I don't actually live on that beach, but I am lucky to live right across the street from it. Everyday seems like a new year here- 5 parties a day, but no one stays up past 9PM. Thanks for all your New Year News folks !